No Imperialist Intervention in Venezuela! 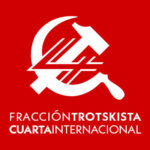 Declaration of the revolutionary organizations of workers, women and youth from Latin America, Europe and the United States that make up the Fracción Trotskista—Cuarta Internacional (FT-CI) / Trotskyist Fraction—Fourth International (TF-FI). 3. The region’s governments that make up the Lima Group, led by Presidents Sebastián Piñera (Chile), Mauricio Macri (Argentina), Jair Bolsonaro (Brazil) and Iván Duque (Colombia), have joined this interventionist, pro-coup crusade while attacking democratic rights and freedoms in order to impose reforms and austerity plans on workers, as dictated by the IMF and imperialism. Along with them, the coup attempt has the support of various European governments, led by French, Spanish, German and British imperialism. Dialogue with the coup plotters, promoted by the Vatican and countries such as Mexico, cannot lead to any positive outcome for workers, only to a “negotiated solution” with imperialism and its local servants. 4. 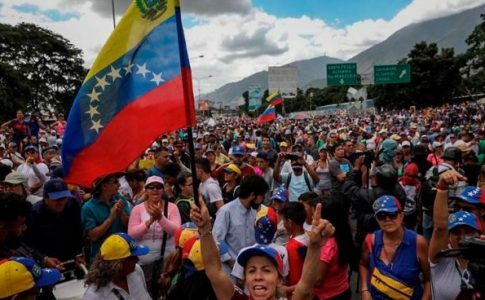 The Venezuelan right uses the country’s economic and social catastrophe, and the weariness of the masses with the anti-worker, anti-people and repressive economic policy of Maduro, to seek an internal base for the coup. But all they intend to do is loot and plunder the great majority of the people by applying a harsh neoliberal plan, which they pompously call the “Plan País” or “Country Plan,” with recipes that are well known to the peoples of Latin America—privatization, foreign debt, firings of public employees, etc. 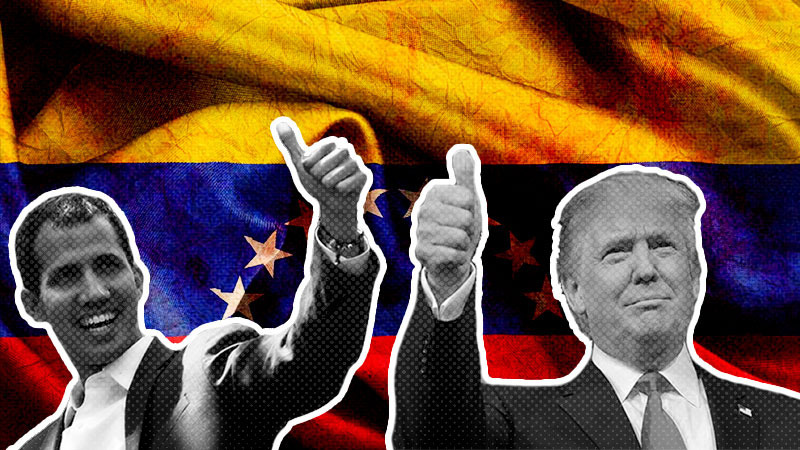 It is no surprise that it is the same pro-coup, big-business and pro-imperialist right that carried out the coup against former Venezuelan President Hugo Chávez in 2002. Coup leader Juan Guaidó’s self-proclamation as “interim president” was quickly recognized by the United States, the great majority of the imperialist powers in the European Union (beginning with Macron and the “socialist” Pedro Sanchez) and the region’s right-wing governments, with whom China maintains some informal contacts. This is clearly an attempt at a coup to install a puppet government serving the interests of imperialism. The pressuring of the armed forces to break with Maduro and force him out of power, and the promise of a wide-ranging amnesty, also demonstrate that they seek to govern with these same corrupt and repressive armed forces. 5. This condemnation of the attempted coup does not imply any endorsement of or political support for the Maduro government, which in practice co-governs alongside the armed forces and which is responsible for the trap in which the Venezuelan people now find themselves. From the beginning, Chavismo established a regime with the armed forces as the principal base of power, in which the role assigned to the masses was to mobilize in support of the government. The people’s organizations and a good part of the workers’ movement were therefore brought under state control. Chávez achieved important levels of political autonomy from imperialism and wrestled with imperialist capital for a higher portion of the oil revenue, and also recovered national businesses that had been privatized during the neoliberal offensive of the 1990s, providing for a relative redistribution of income made possible by the long period of high oil prices, and thus winning the broad support of the masses. But despite the rhetoric about “revolution” and “socialism of the 21st century,” the Chavista government did not free Venezuela from its subordinate and dependent role in imperialist capitalism; all the while it encouraged the idea of “national development” alongside a hypothetical “patriotic and productive” bourgeoisie. Because of this, the country remained subject to the plundering of its resources through foreign debt, transnational profits (which now went to Russian and Chinese capitalists, as well as American and European ones) and the looting of oil revenues by the traditional bourgeoisie, the capitalists aligned with Chavismo and top government bureaucrats. The oil bonanza and foreign debt, which under the Chávez government allowed a huge transfer of public revenue into private hands, did not bring any qualitative development of the productive forces, and when the bonanza came to an end, the country was more dependent than ever on oil revenue and imports. It had very high foreign debt and suffered a huge gap in its finances due to billions of dollars in capital flight. 6. When oil prices plummeted and the deadline to pay off the foreign debt was due to expire, Maduro opted to guarantee the interests of international financial capital and profit-seeking investors, and he applied harsh austerity measures against the people. He rigorously complied with debt payments, at the cost of producing a drastic contraction in the country’s imports, including food and medicine. 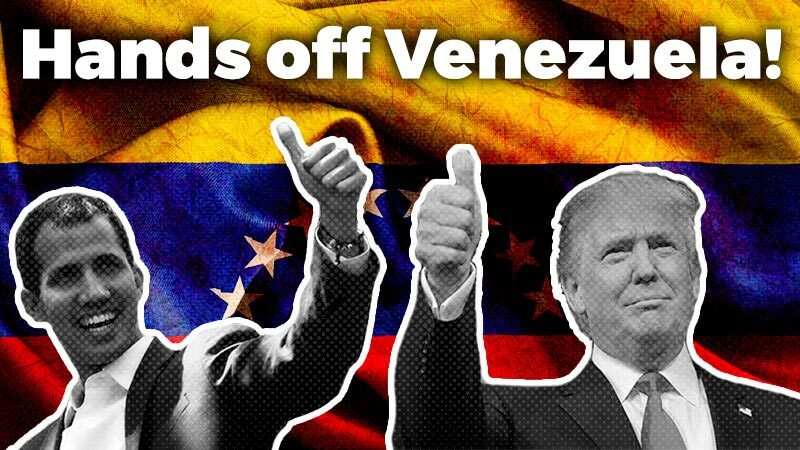 New debts were taken on with China and Russia, debts that China collects through oil, and thanks to which 49% of Citgo, the Venezuelan state oil company’s subsidiary in the United States, has been pledged as collateral to Russia’s Rosneft. Far from taking any anti-imperialist measures, Maduro chose the road of submission in the oil sector (violating the country’s own national legislation to benefit the oil companies), the mining sector (with the disastrous Arco Minero del Orinoco), and with a new foreign investment law that was more accommodating to international capital. Far from reversing the looting of revenue, it drove the workers and the poor into brutal hyperinflationary austerity that pulverized wages. Coming out of the oil bonanza, the big state companies in iron and steel, sugar and food are now heading toward bankruptcy, while production levels at PDVSA, the state oil company, have fallen to levels not seen since 1950. With severe shortages, the astronomical devaluations of the bolivar and hyperinflation, and starvation wages that have sunk down to $5 a month, people’s living standards have fallen dramatically. The full brunt of this crisis is being most brutally felt by women workers and the poor masses. Another element of this policy saw Maduro move to violate collective bargaining agreements in both the public and private sectors, which alongside this genuine massacre of historic wages and rights, provides capital with one of the cheapest sources of labor in the world. Massive layoffs in private companies have also been endorsed and sectors of big business exempted from paying taxes. The government’s repressive response to workers’ struggles has included the imprisonment of union leaders and the use of vigilante groups to intimidate them. This whole scenario has allowed the right to win a new mass social base, capitalizing on the massive rejection of the government in the absence of a working-class alternative. 7. The original plan of the Venezuelan right, which was to split the armed forces and have them stage a coup against Maduro, has so far failed. On February 23, the right and imperialism suffered a major setback when they tried to use “humanitarian aid” to implement a “regime change.” They tried to achieve this operation through USAID, an organization that has always participated in the CIA’s regime change operations. Until it was demonstrated that the fire that burned the truck delivering “humanitarian aid” on the border between Colombia and Venezuela had been set by Guaidó’s own supporters, the Trump government and Guaidó blamed this action on Maduro as if it were some sort of “crime against humanity.” From this point, there has been a stalemate. The United States is threatening a military invasion but neither the internal relation of forces nor the external “consensus” would permit an invasion of Venezuela. 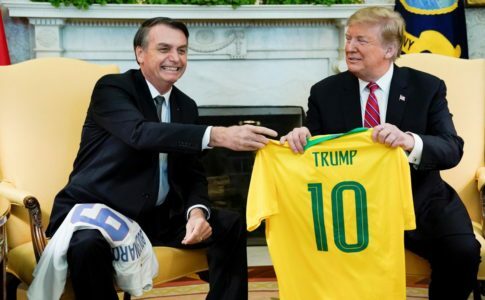 The United States’ most servile allies, like Duque and Bolsonaro, do not seem willing to do the military dirty work in Venezuela, as that would risk unleashing a broad response from the masses in their own countries. In this context, the key imperialist policy becomes economic suffocation and an aggressive confiscation of assets and resources: The Trump government, with the backing of the Venezuelan right, is clearly and simply expropriating the resources of the Venezuelan people, withholding oil payments, assuming control of Citgo and disposing of its revenue. This is an act of unprecedented interference, one that not only tramples on national sovereignty but also exacerbates the poor living conditions of the Venezuelan people. 8. The Venezuelan people have just begun to emerge from the critical situation caused by the massive national electricity blackout that affected the most basic living conditions for several days. A large part of the country still continues without the restoration of basic services. The right wants to use this situation to achieve an internal base for their coup plans. Guaidó is as hypocritical as his imperial partners. He cries crocodile tears for hospitals without power while calling for direct military intervention and supporting the confiscation of Venezuela’s goods and resources and their use to fatten the accounts of international capital through public debt. For the right and imperialism, the suffering of the Venezuelan people is a tool to serve their interests. While this obscene imperialist aggression overtly pursues the overthrow of Maduro by a military coup or some other means of force, including economic strangulation and constant threats of military intervention, there is a real possibility that, given its responsibility for all kinds of criminal sabotage in its long history of interventions, the United States is indeed behind some form of sabotage. It is also possible that the national electricity grid simply collapsed, after years of deterioration and crisis, with constant blackouts that caused cities and regions to spend days or weeks without electricity, a reality that was pointed out again and again by the workers in the electricity sector, some of whom have paid for their warnings about the critical situation with prison sentences. The preservation of the electrical grid in public hands and the establishment of direct management by the workers themselves, displacing the corrupt and anti-worker “civilian-military” bureaucracy responsible for the current situation, is the only truly progressive solution to the catastrophic situation that Venezuela’s electric system now finds itself in. 9. The alternative is a mobilization of the working class and the poor masses against the attempted coup and any form of imperialist interference, and against all austerity measures, whether implemented by the Maduro government or through Guaidó’s “Country Plan”. Those of us who have signed this declaration maintain that Venezuela must be governed by its workers and that they must begin a throughgoing reorganization of the economy that attacks the interests of the capitalists and imperialism in order to satisfy the most pressing needs of the people. No to payment of the foreign debt; repatriation of capital lost through capital flight via exceptional measures to force the white collar criminals who rob the country to return what they have stolen; the imposition of a state monopoly of foreign trade; the cancellation of all agreements that hand over the nation’s natural resources, such as the Arco del Orinoco and oil reserves, placing them under the control of their workers; confiscation of the property of those who plundered the country in order to use these resources to satisfy the urgent needs of the people and the country. Full adherence to collective bargaining agreements and a minimum wage at least equal to a basic living wage, indexed monthly according to inflation, combined with real price controls set directly by workers and communities, with delegates democratically elected by the rank and file in the workplaces and the neighborhoods, which would place production and distribution under the genuine control of the people without government or military bureaucrats; reinstatement of all dismissed workers; rejection of layoffs in both the public and private sectors; occupation and production under workers’ control—without the military or the government—of any company that lays off workers or threatens to shut down. Freedom for all workers imprisoned for taking part in struggles and an end to the trials of workers, peasants, poor people, students and indigenous people prosecuted for protesting; and the dissolution of the Bolivarian National Guard (GNB), the FAES special police units and all organs responsible for repressing the people; among other indispensable measures against the current collapse. 10. 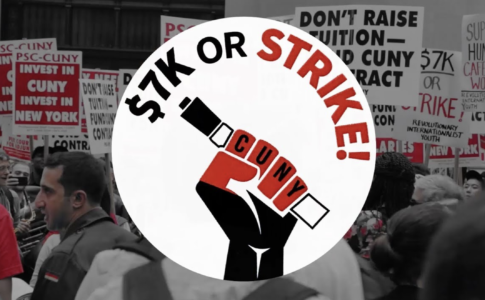 The struggle for a program such as this will allow workers’ organizations to win their independence. This implies the expulsion of the pro-government bureaucracies from the unions, which play a treacherous role as government agents within the labor movement, as well as the ousting of the union bureaucracies that answer to the right and aim to limit the workers’ movement to becoming part of Guaidó’s coup offensive. 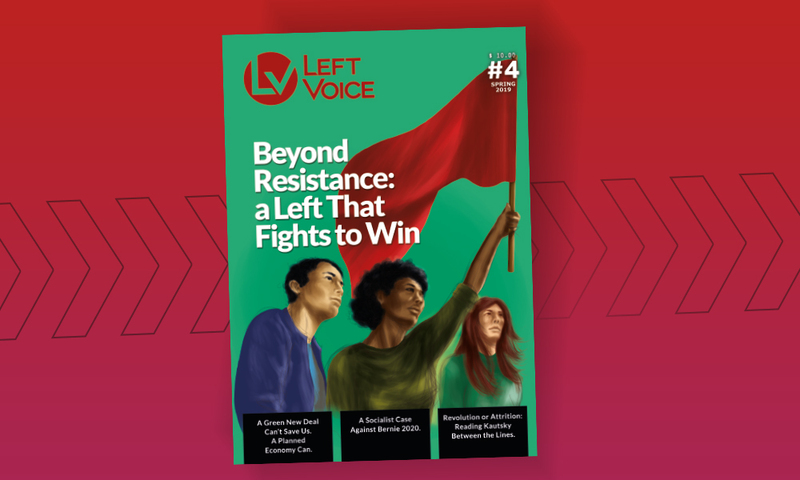 In the heat of the struggle for these demands, united front organs of direct democracy can emerge both within the workers’ movement and among working-class and poor sectors, including women and youth, that would form the basis for a potential alliance between the working class and the poor masses. Workers’ self-organization also implies the right and the need to organize their own self-defense against the repression of the armed forces and the paramilitary gangs. This need becomes more concrete with the renewed repressive advance of the Maduro government, expressed not only in the imprisonment of workers in the electricity sector, but in a more reactionary fashion in the call that has been made to the so-called “colectives”, which in fact are vigilante groups, to “activate” in order to “defend peace” and uphold order. 11. As the Trotskyist Fraction (FT-CI), including our organizations in different countries and the network of digital newspapers La Izquierda Diario, we are part of the mobilizations against the coup attempt, such as those called by the Frente de Izquierda y de los Trabajadores (FIT—Workers’ Left Front) in Argentina. We call for the broadest mobilization of workers all over the world, and especially in the imperialist countries that are supporting the offensive in Venezuela, as well as throughout Latin America, against this attempted coup and imperialist interference, independently of the Maduro government, for a working-class political solution for Venezuela and for the socialist unity of Latin America and the Caribbean. 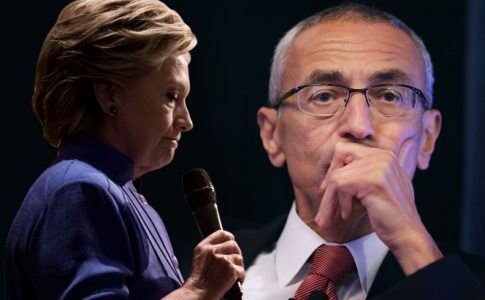 The FBI’s reopened investigation and the Podesta emails introduce unstable ground for Hillary Clinton just days before the elections.